Amaranthine Flowers By Design offers you the gorgeous Ethan Arrangement, with long lasting oriental lilies, singapore orchids, and seasonal flowers in a ceramic base. 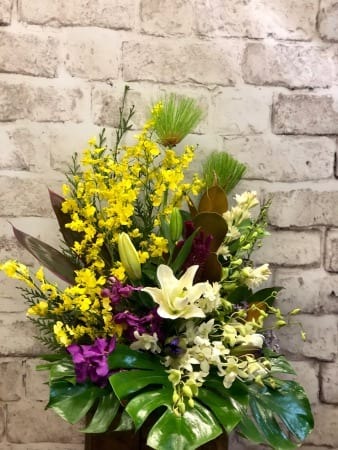 A unique arrangement, this will look gorgeous, adding a special touch to any room and make a fabulous gift to friends, family or business to business to say congratulations on your new baby, thinking of you or just because. The Amaranthine Flowers By Design Ethan Arrangement is a beautiful way to say it all. Same day delivery, six days a week, available to all areas of Newcastle, Lake Macquarie and Maitland. Including John Hunter Hospital, Newcastle Private Hospital, Lake Macquarie Private Hospital, Maitland Hospital and Mater Hospital. Include a message on our complimentary gift card or enhance your flowers with one of our fantastic add-on gifts, your selection of chocolate, wine, bears, balloons or many more.